In a medium bowl, beat mascarpone cheese, yogurt and sugar until smooth. In a separate bowl, beat cream until stiff peaks form. Carefully fold whipped cream into cheese mixture; set aside. Combine nectar and rum in a small shallow dish. 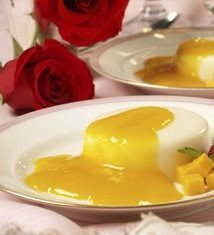 Quickly dip each side of the ladyfingers into the mango nectar mixture. Place half of the ladyfingers in the bottom of a 8-inch glass baking dish so they fit tightly. Spread with half of the cream mixture, then top with 3/4 of the mango slices. Repeat ladyfinger and cream layers, then sprinkle with chocolate. Cover tightly and chill for at least 6 hours or up to 24 hours. Cut into 8 equal pieces; garnish with remaining mango slices and mint leaves. Serving Tip: May be served refrigerated or frozen.